i-D Magazine plays on the contrasting beauty of rising stars Juliana Schurig and Carla Ciffoni for its Spring/Summer 2014 issue. The pair explore their inner rockstar as they raid the make-up kit with photographer Nick Dorey documenting their antics. 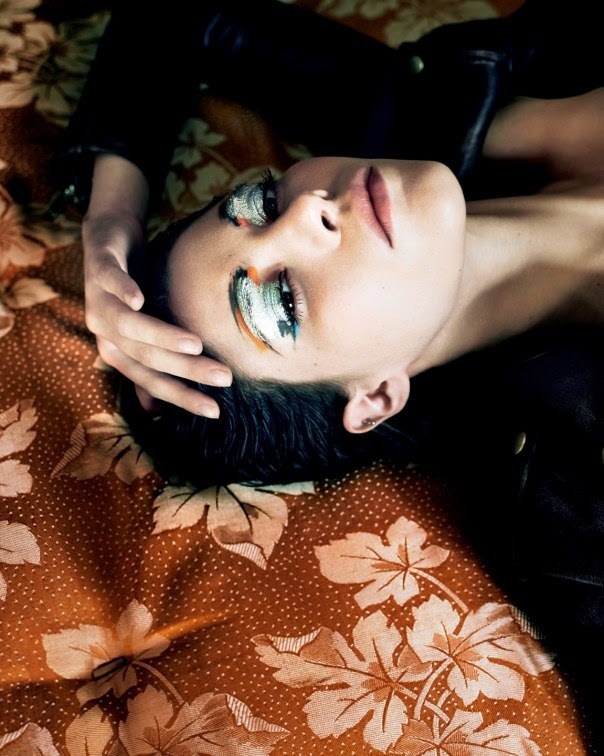 Make-up artist Isamaya Ffrench adorns the girls faces with shimmering face and eye make-up in metallic hues of silver, copper, and gold. The dark brooding features of Argentine Ciffoni make for a stunning juxtaposition with Schurig's blonde blue eyed All-American beauty. IMG Model Management-repped Ciffoni was one of the undisputed breakthrough newcomers to emerge at the Fall/Winter 2014 collections gracing a total of 46 runways including Alexander Wang, Burberry Prorsum, Christopher Kane, Gucci, Hermés, and Christian Dior. Ciffoni's tough androgynous chic and powerful runway presence galvanised the attention of key note casting directors across all four fashion capitals. Meanwhile, New Jersey native Schurig continues to command the fashion industry's attention since her stunning comeback at the Spring/Summer 2013 season. With a Fall/Winter 2014 show tally of 32 bookings and recent editorials for W Magazine, i-D, Russh, and the Chinese, Portuguese, and Australian editions of Vogue, Schurig has her sights set on making her mark as a true long-term contender.